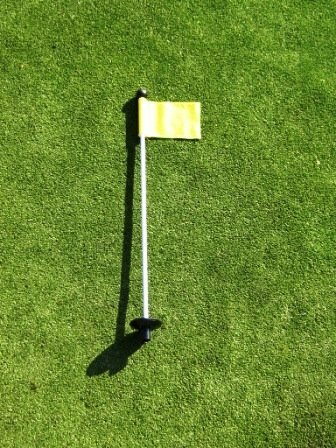 30 inch Practice Green Marker with a YELLOW Flag and Attached Ball Retrieval Disk - The Easy To Grab Knob makes lifting the marker effortless and eliminates the need to bend over to retrieve you golf balls that have successfully made it into the cup. The 30 inch reinforced white fiberglass shaft has a nuel on the bottom that perfectly fits into any PGA Regulation Golf Cup (plastic, aluminum, or Zinc). The Colored Flag is a Lightweight 400 denier nylon construction which makes the flag sensitive to even gentle breezes, giving golfers a better determination of wind direction. Engineered to maintain their good looks despite long exposure to wind and sunlight. Improved steadfast colors, thanks to a patented DuPont process. Unlike heavy sailcloth flags, ours minimize premature wear on sticks and cups, and decrease the chance of flagsticks being blown out of cups.This item is available in the following flag colors: Red, Blue, Yellow, White, Green. All available on our TJB INC Amazon Store. Denier is a good measure of strength and durability when you're comparing two deniers of the same material. For example, a 200D nylon flag is not as strong as a 400D nylon flag sold by ShopTJB. However, when you're comparing between different materials (for example, nylon and polyester) all deniers are not equal. Since nylon is a stronger material than polyester, 400D nylon is actually stronger than 600D polyester.